Review: Humanity discovers a mysterious and an obvious artificial object that is buried beneath the lunar surface. The intelligent computer H.A.L. 9000, sets off on a quest of discovery. Stanley Kubrick’s films include the amazing Barry Lyndon (1975), Paths of Glory (1957) and A Clockwork Orange (1971). Based on Arthur C. Clarke’s story The Sentinel. This is an engrossing, baffling and beautifully made film. This film is about the evolution of man, the meaning of life and the possible existence of a Supreme Being. This is a film that you can still watch to this very day and be amazed by it and at the same time emotionally moved. The special effects are incredible especially for the time it was made. The most famous quote in this is “I’m sorry, Dave. I’m afraid I can’t do that.” Another film that is quite similar to this that came out a few years ago is Interstellar (2014). This is actually Christopher Nolan’s favourite movie. Pink Floyd, the English psychedelic rock band were at one point approached to provide the music for this film. However they turned it down due to other commitments. The actual “Space Station 5” model, was found a few years after the film was made. It was just discarded in an English field with wild grass growing over its rapidly decaying surface. Sadly the model was destroyed by vandals a few days later. 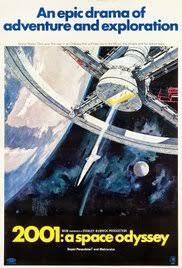 2001 A Space Odyssey is a must see film!! At the Academy Awards in 1969 this won 1 award and that was for Best Effects, Special Visual Effects. At the Bafta Awards in 1969 this won 3 awards. They were for Best Art Direction, Best Cinematography and Best Sound Track. Film Critic Barry Norman produced a list at the start of 2012 in The Radio Times of his 101 Greatest Films of All Time and this was in the list.